35/82 Kelly Metz Better than The Davinci Code, but that's not saying much. 74/169 Max Braden The cinematography makes for a beautiful tour of the Vatican's art, but the plot is more like a basic Tom Clancy (Sum of All Fears, for instance) race to beat the clock than symbolophile mystery. When is a sequel more like a prequel? Herein lies your answer. The world’s only famous symbologist, Robert Langdon, made his first appearance in Angels & Demons, a 2000 novel by soon-to-be-famous author Dan Brown. His follow-up release came in 2003. It’s called The Da Vinci Code. Maybe you’ve heard of it. When that novel started selling as if it was the latest Harry Potter book, Sony showed the forethought to secure the rights to both Brown titles. The only question was whether an Angels & Demons movie would ever be made. 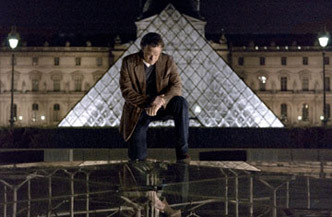 Such a production’s eventual creation depended upon the success of the first adaptation, The Da Vinci Code. $750 million in worldwide revenues later, that matter has been resolved. The instant Ron Howard agreed to direct and Tom Hanks agreed to star in the movie, The Da Vinci Code’s financial well-being was secured. Audiences were all too willing to overlook Hanks’ unfortunate hair decisions, making the movie the fifteenth production ever to open north of $75 million domestically. Given the critical bile directed at the adaptation, the blockbuster opening as well as the $217.5 million in domestic box office is impressive. The worldwide totals are simply stunning. With Sony making three quarters of a billion dollars on that project while owning the rights to its prequel, a follow-up is inevitable. The trick is in the implementation. Angels & Demons treads remarkably similar territory to The Da Vinci Code. While lacking the controversial religious angle that led to massive sales for the first movie, the story is otherwise identical. Langdon is chosen to investigate a secret society, and it’s the Illuminati this time. Apparently, they are ready to settle their grudge with The Vatican once and for all, and they have acquired just the doomsday weapon to make it happen. The Illuminati have come into possession of a doomsday weapon, enough anti-matter to blow up an entire community. Langdon’s search begins in a familiar way. The corpse of a respected scientist is discovered and yes, his flesh has been mutilated. This time, it’s with an ambigram, a word written in a matter such that it appears identical when viewed in a mirror. From the moment of this discovery, Langdon begins yet another desperate search for the truth before time runs out. See the latest developments for this project on the Angels & Demons Movie News page.